The Washington Post asked a federal court to dismiss the $250 million defamation lawsuit filed by the parents of the Nick Sandmann who allege that the paper defamed him in its coverage of the Kentucky teen’s viral encounter at the Lincoln Memorial back in January. The Post also took issue with “inflammatory rhetoric” of the complaint and the “nonstop public promotion of the suit” to combat the paper’s alleged political bias against President Trump. “Politics has nothing to do with this case, and law warrants its dismissal,” the Post says. The family of the Kentucky teen at the center of a viral encounter with a Native American activist last month is seeking $250 million in damages from the Washington Post for their coverage of the conflict. According to allegations outlined in a lawsuit filed by Sandmann’s family in the U.S. District Court Eastern District of Kentucky Northern Division at Covington, the Post published “False and Defamatory Accusations negligently and with actual knowledge of falsity or a reckless disregard for the truth,” in seven articles published about the incident in print and online, as well as in tweets used to promote the articles. 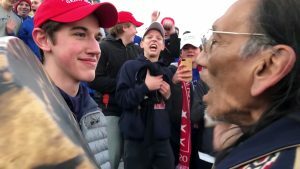 News and video footage from the event sparked a nation-wide controversy centered around Sandmann and his classmate’s behavior on January 18 when they crossed paths with 64-year-old Nathan Phillips at the Lincoln Memorial. Phillips had participated in the Indigenous Peoples March at the National Mall, and the Covington Catholic High School students had attended the March for Life anti-abortion rally on a school trip. The students were waiting for their buses to return to Kentucky when they encountered Phillips. The suit alleges that the Post relied on video posted on a fake Twitter account on the night of the encounter to inform its reporting. In the video, a smiling Sandmann is wearing a red “MAGA” hat surrounded by his classmates while standing face-to-face with Phillips, who is beating a drum and chanting. But according to the suit, there was more to the story than the video showed, and that it was Phillips who “instigated a confrontation.” A longer video of the incident was later released which the suit asserts more accurately portrayed what happened at the National Mall. An investigative firm retained by the Diocese of Covington released a report last week that concluded that the students did not instigate the incident and or make “offensive or racist statements” towards Phillips. The amount of damages that the plaintiffs are seeking is the same amount that Jeff Bezos paid when his company, Nash Holdings LLC, purchased the Post in 2013.